Click on map to expand for full metro & tram network! Minsk, the capital city of the former Soviet republic of Belarus, has 1.76 million inhabitants and is right in the centre of the country, more or less half way between Berlin and Moscow. 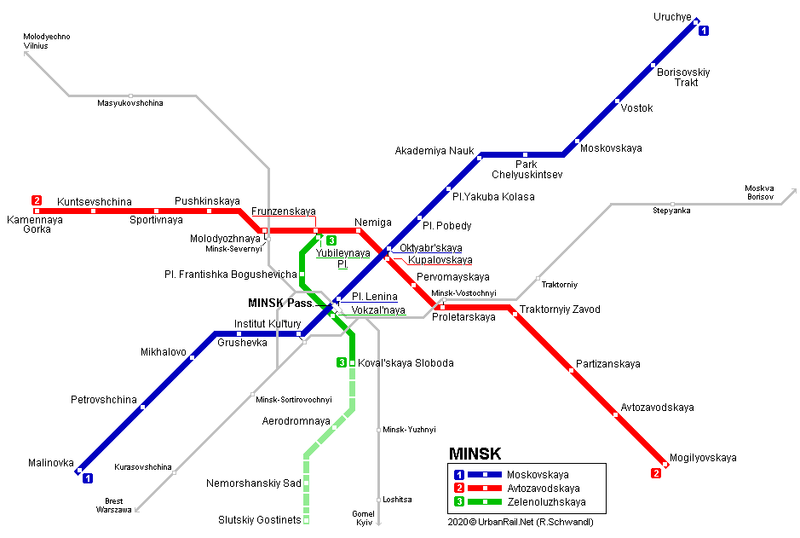 The Minsk metro network is a typical triangle system opened on 26 June 1984, after 8 years of construction. There are plans for a basic network of 58.3 km and 45 stations (3 lines). Line 3 should become a north-south line crossing the other two lines at Frunzenskaya (formerly Yubileinaya) and Pl. Lenina (for some time called Pl. Nezavisimosti / Pl. Niezalezhnasci - railway station). Due to geological conditions a shallow alignment was chosen for the Minsk metro (average 12-14 m). During construction of the Nemiga station, remains of an ancient city were found. Archeologists worked on the site for two years but eventually everything was covered with sand. The Minsk Metro has standard Russian gauge (1524 mm), platforms are 100 m long and 10 m wide. Maximum speed of metro trains is 80 km/h on the first line and 70-80 km/h on the second line, except for the span between stations Nemiga and Frunzenskaya where trains run at speed 45 km/h. Since September 2002, 5-car trains have been running on the first line, while a fifth car was added to trains on the second line in June 2009. The stations are accessible via pedestrian subways, only three stations in the centre have entrances in existing buildings: Oktyabrskaya, Kupalovskaya and Pl. Lenina. All stations except Pervomayskaya have island platforms. Mogilyovskaya, opened 5 Sept. 2001, was the first metro station in the ex-USSR to be equipped with elevators. In the future, a third line will run from the residential area of Zeleny Lug in the north to Kurassovshina in the south, crossing the existing lines at Pl. Lenina and Frunzenskaya (17.2 km). Construction started in March 2014. The first section is scheduled to be completed in 2019 and will run from Yubileynaya Ploshchad' to Koval'skaya Sloboda with two intermediate stations. In a second stage, the line will be extended to Nemorshansky Sad with an intermediate station at Aerodromnaya (2020). A fourth line might become a semi-circular line from Vesnyanka in the northwest to Serebryanka in the south, via Akademiya Nauk and Traktornyiy Zavod on the existing lines. Thanks also to A. Sinurin and Alexei Bobko!